After hours of in-house shock dyno analysis and miles of on and off-road ride tuning, ICON Vehicle Dynamics is excited to announce the release of a 0-2” Suspension System for the 2010-UP Jeep Grand Cherokee. As more and more modern SUV’s focus on creature comforts and styling, the Jeep Grand Cherokee (WK2) is a surprisingly capable vehicle that can easily serve double-duty as both a refined daily driver and a trail-ready weekend warrior. ICON engineers developed the 0-2” Suspension System to offer increased wheel travel, decreased body roll, and a more confidence-inspiring ride characteristic. The mild lift that this system provides also allows for the fitment of larger wheel and tire combinations that will increase ground clearance – a big plus for those taking their Grand Cherokee off the beaten path. ICON has developed a vehicle-specific valving for 2.5 Series coilovers and rear shocks featured in this kit, which translates into an excellent ride across almost any terrain. 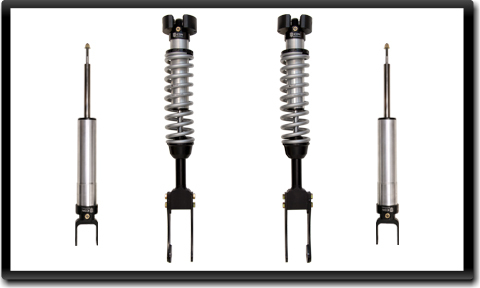 These components are also 100% rebuildable and revalveable, which means they are the last set of shocks that will ever need to be installed on the vehicle. ICON Vehicle Dynamics products are all proudly made in the USA at our Southern California-based facility by a team of passionate off-road enthusiasts. With a reputation for quality, performance, and service ICON is the top choice when it comes to suspension for the 2010-UP Jeep Grand Cherokee.